I'm really excited to tell you about these brand new resources for your secondary history classes! 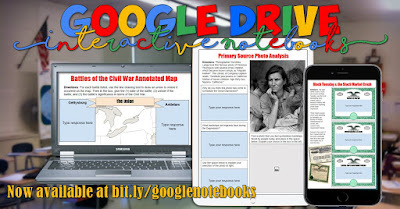 They are sets of fully-editable, digital online Interactive Notebooks using Google Drive! 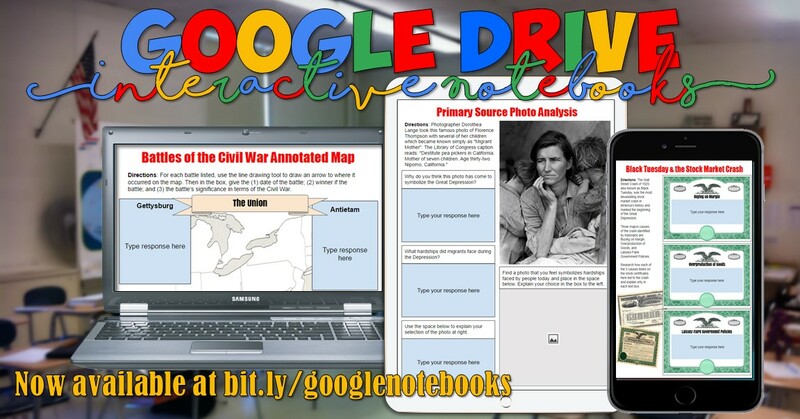 Each is based on hugely popular traditional interactive notebook sets, however these can be completed all online with laptops, tablets, phones, or any other device that supports Google Drive! Current sets include the Great Depression, World War 2, and the Civil War. And more sets are on their way soon! For each, students type directly on the pages, insert images, and drag and drop information for a variety of engaging, interactive activities! This is a fantastic way to integrate technology into your classroom and can be completed without printing any paper! Awesome for a 1:1 school or just a trip to the computer lab. They are also fully printable if you want students to save them in their notebooks. Answer keys are included with each set of interactive notebook pages along with 2 pages of teacher directions. All you only need is a Google account and you're ready to go! You can download these digital Interactive Notebooks by clicking here! If you think you'd like access to these plus over 500 other amazing lessons for throughout the school year, check out my new site - StudentsofHistory.org! For one monthly subscription, you get immediate access to all of these Google Drive resources, plus PowerPoints, project-based learning, interactive notebooks, review materials, tests, and more! Check out my American History and World History curricula and how to join today!